Yesterday I dithered a bit about Citizens United. Today I’m going to dither a bit about Ben Bernanke. Since I was opposed to Bernanke’s renomination from the start, you’d think I’d be pretty happy about the growing opposition in the Senate to confirming him for a second term as Fed chairman. But for a couple of reasons, I’m not sure I am. Bernanke is Obama’s choice, and he deserves a fair amount of deference in that. Bernanke isn’t unfit for office, he’s plainly well qualified, and he isn’t wildly outside the mainstream of economic/monetary opinion (quite the contrary, unfortunately). That should be enough. I imagine, though, that most of you don’t find this very persuasive. So here’s a second, related reason: If Bernanke goes down, who would Obama nominate in his stead? Here’s the problem: the opposition to Bernanke isn’t principled, it’s a toxic partnership of left and right that would almost certainly force Obama to choose someone even worse. The reason to oppose Bernanke, after all, is that even if he did a good job steering the Fed through the 2008 financial crisis (and I think he did), that’s not what we need now. What we need is someone who can unwind the Fed’s balance sheet (a technical job that’s largely up to the Fed staff) and who will be a champion for a smart and reinvigorated regulation of the financial sector.2 Barbara Boxer and Russ Feingold, two of the Democrats who are opposing Bernanke, are surely on board with that, but what are the odds that Richard Shelby and Jim DeMint, the Republican leaders of the opposition, would support someone with genuinely progressive views on bank regulation? About zero. If Bernanke goes down and we’ve implicitly approved of the notion that high-profile nominees can be filibustered, Republicans and “centrist” Democrats will almost certainly band together to take down a more liberal alternative to Bernanke too. I’m not excited about Bernanke’s reappointment, but teaming up with wingnuts to filibuster him would do far more long-term damage to the progressive agenda than giving him another term. Once that’s done, we become hostages to them. I think Obama was wrong to renominate Bernanke, but he’s the president, not me. He should be allowed his choice. POSTSCRIPT: But while we’re on the subject, I’ll also say this. If I had to choose between Brad DeLong’s belief that Bernanke privately has sound views and Matt Yglesias’s view that Bernanke can be far more easily understood as simply a conventional conservative Republican, I think Matt wins in a walk. The evidence that Bernanke is, both privately and publicly, a smart but conventionally conservative economist, is overwhelming. It should hardly be a mystery that he acts like one. 1Judicial appointments are a different story. For practical reasons, I think presidents still deserve a fair amount of deference here, but less than when they’re dealing with their own branch of government. 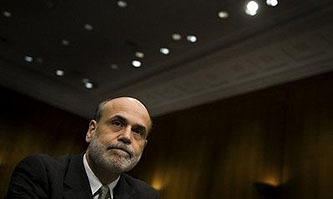 2There are, of course, lots of other arguments both for and against Bernanke’s nomination. Some are good (he’s made too many mistakes to deserve reappointment, voting him down would damage Obama when he can least afford it) and some are bad (voting against him would roil the markets! we’re mad at him for spending lots of money!). I’ll leave those for another day.